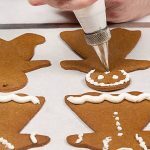 Royal icing is both decorative and useful as an edible “glue” to attach other elements such as candies, edible glitter, and sparkling colored sugar, especially for holiday cookies and Gingerbread Folks. 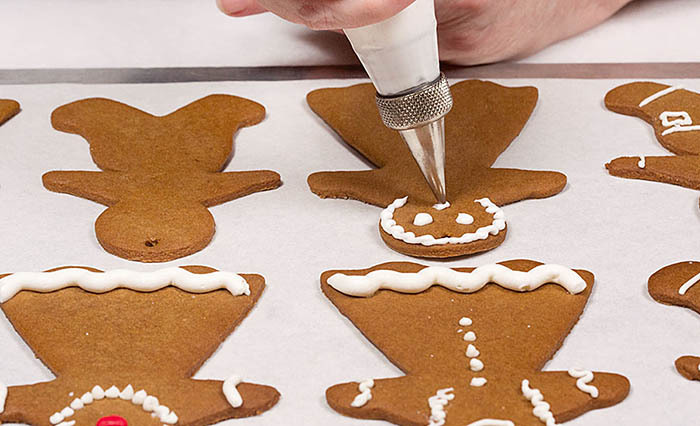 Royal icing is easy to make but also can be purchased at cake decorating supply stores. • Into the bowl of a stand mixer, weigh or measure the powdered sugar. • Into a 1 cup glass measure with a spout, weigh or measure the egg whites. 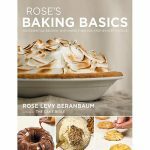 ROYAL ICING is excerpted from Rose’s Baking Basics © 2018 by Rose Levy Beranbaum. Photography © 2018 by Matthew Septimus. Reproduced by permission of Houghton Mifflin Harcourt. All rights reserved. Pour the egg whites into the sugar. Attach the whisk beater and beat on low speed until the sugar is moistened. Gradually raise the speed to high and beat until the icing is very glossy, with stiff peaks that curve slightly from when the beater is raised slowly (about 6 minutes). If necessary, scrape down the sides of the bowl. If the icing is too thin, beat in more powdered sugar. Use a silicone spatula to scrape the mixture into a small bowl. Keep the bowl covered with a damp towel. Store airtight in a glass container (plastic is petroleum based and can break down the icing): refrigerated, 3 days. Rebeat lightly before using.